The pace of everyday life varies depending upon what day of the week it is. In just the same way it changes depending upon the time of day or night when something is happening. Certain businesses and services can vary their operational hours depending upon their customer availability, product marketability preferences or particular appropriateness of various activities performed that are enhanced on certain occasions. Many civic facilities are always open to the general population and often we take full advantage of our communally shared water, sewer, garbage and electric power outlets. When we look much closer at certain abuses we consider to be just part and parcel of everyday maintenance we can see the overall effect now and in the years to come. 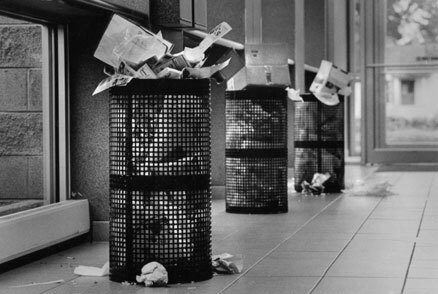 In the lobby of The Peace Arch City post office on this typical late Sunday afternoon we can see the effects of public litter. Uncountable junk mail and discarded boxes with packaging are thrown in the direction of collection cages. I then uncovered my own dependency upon others to clean up after me. Ironically, I do remember mom and dad picking up my things to enlighten me, so I would do it for myself, someday.